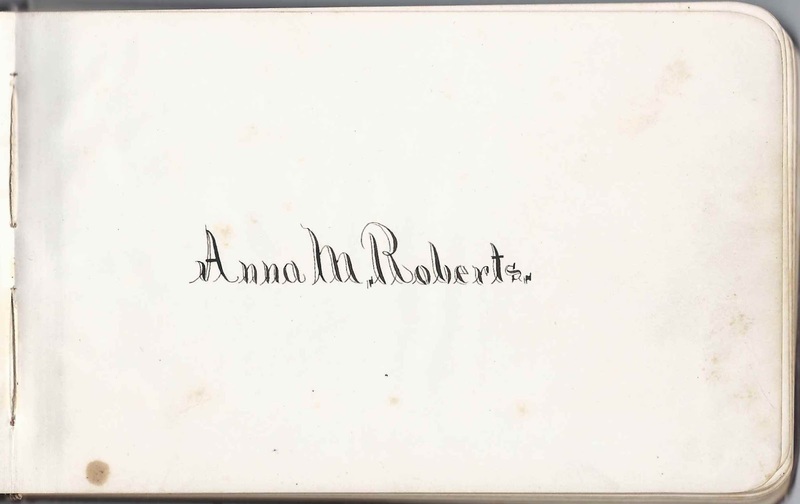 1880s autograph album that belonged to Anna M. Roberts of St. Johnsbury, Vermont, some collected while she was attending St. Johnsbury Academy. Many of the signers gave their residence as St. Johnsbury Centre, Vermont, or St. Johnsbury Center, Vermont. 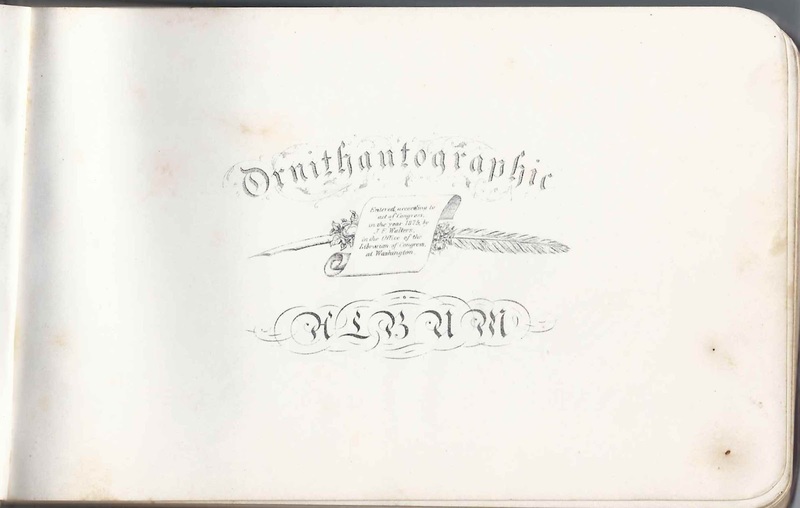 The album is approximately 6-3/4" x 4-1/4" and contains the sentiments of 64 of Anna's relatives, friends and schoolmates. An alphabetical list of the signers appears at the end of this post. 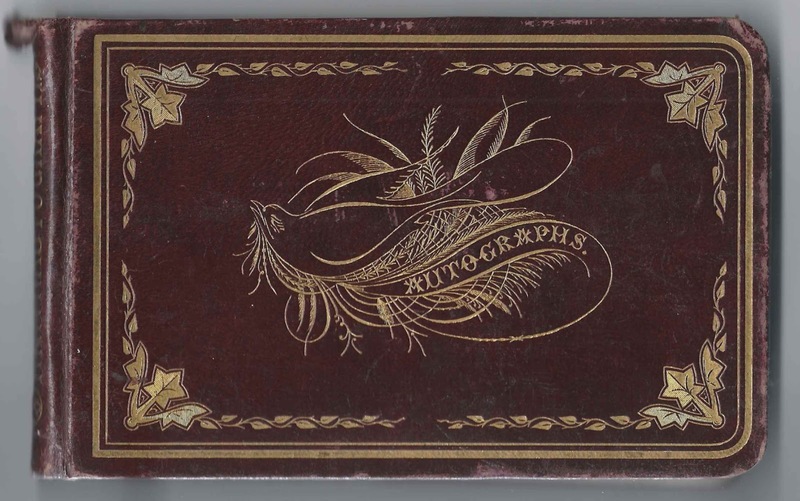 The album, the "Ornithautographic Album", features several fancy preprinted bird designs scattered throughout, but none of the signers took advantage of those pages. Anna M. Roberts [at least one record shows Anna Maybell Roberts] was born 22 September 1865 at St. Johnsbury, Vermont, the daughter of Horatio Nelson Roberts and Adeline (Baldwin) Roberts. I noticed that the Vermont Archives holds some of Horatio's letters, written during his Civil War service. 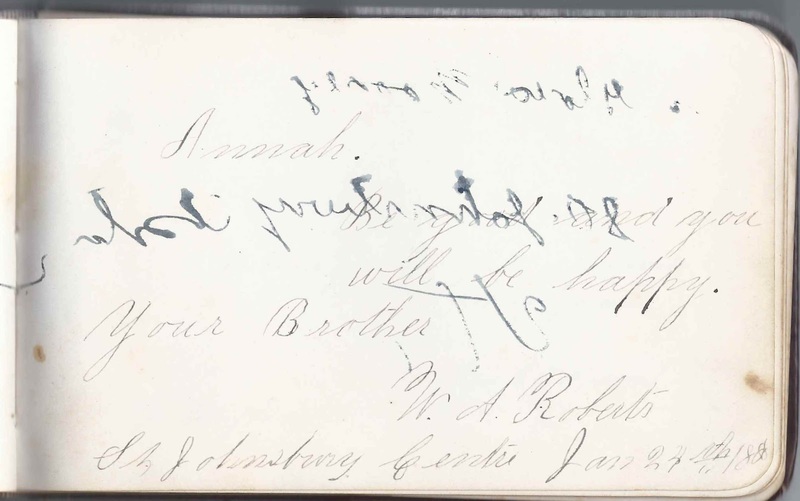 One of Anna's four siblings, William Arthur Roberts of St. Johnsbury Centre, Vermont, signed a page in the album on January 24. He wrote the year on the edge of the page; it's either 1888, or possibly 1880. He called her Annah. I lost track of Anna after the 1880 Census. I found some possible candidates, including a single Anna M. Roberts who moved to Medford, Massachusetts, but I don't have anything definite. Hopefully a reader will provide additional information. Two signers indicated they were Anna's cousins. 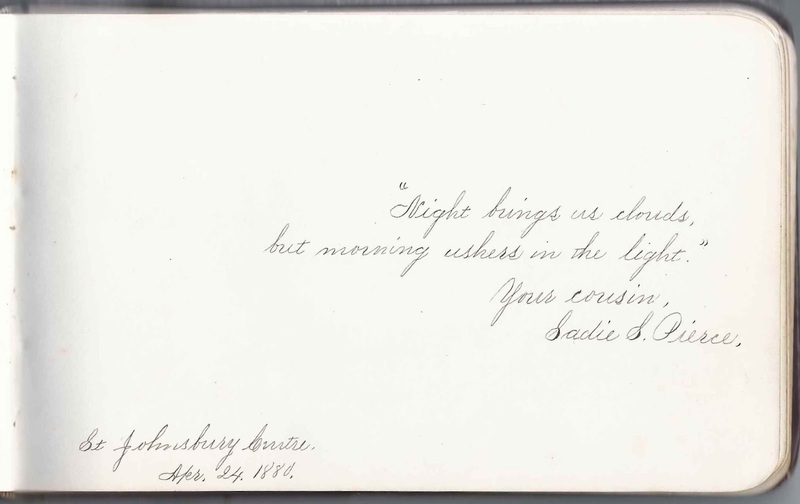 Cousin Sadie S. Pierce of St. Johnsbury Centre, Vermont, signed a page on April 24, 1880. 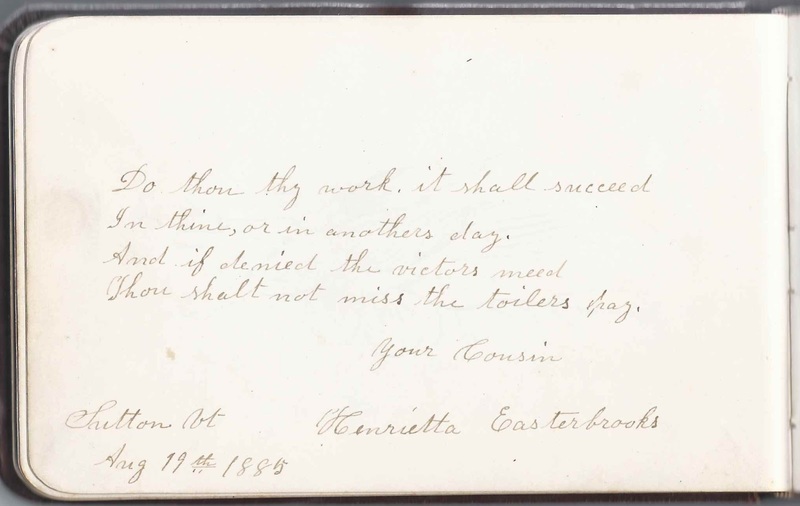 Cousin Henrietta Easterbrooks signed a page at Sutton, Vermont, on August 19, 1885. 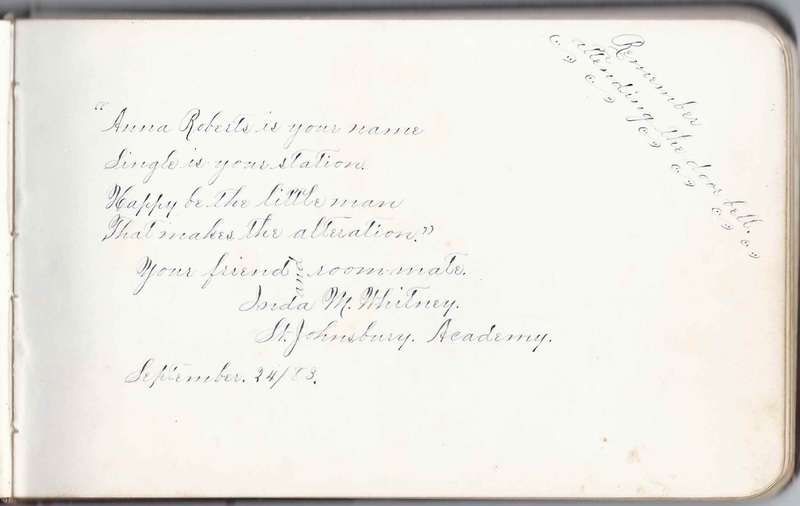 Three students indicated that they were students at St. Johnsbury Academy, including Inda M. Whitney, who signed a page on September 24, 1883 and called herself Anna's roommate. She was Inda Mae Whitney, daughter of Artemas C. and Sarah E. (Stark) Whitney and future wife of Bert A. Farnham. L. C. Dickinson, signed on January 14, 1880. He was Rev. Lucius Chandler Dickinson, whose wife Millicent Ruth (Todd) Dickinson also signed the page. Their children Mary Dickinson and David C. Dickinson signed the facing page. Daughter Clara I. Dickinson signed another page. Mrs. M. R. Dickinson. She was Millicent Ruth (Todd) Dickinson, whose husband Rev. Lucius Chandler Dickinson shared the page. Their children Mary and David D. Dickinson signed the facing page. Daughter Clara I. Dickinson signed another page. Mary Dickinson, signed at St. Johnsbury Centre, Vermont, on January 13, 1880. Her brother David C. Dickinson shared the page. Her parents Rev. Lucius Chandler Dickinson and Millicent Ruth (Todd) Dickinson signed the facing page. Her sister Clara I. Dickinson signed another page. David C. Dickinson, signed at St. Johnsbury Centre, Vermont, on January 13, 1880. He was David Chandler Dickinson, whose sister Mary shared the page. His parents Rev. Lucius Chandler Dickinson and Millicent Ruth (Todd) Dickinson signed the facing page. His sister Clara I. Dickinson signed another page. Clara I. Dickinson, signed on November 4, 1881. She was Clara Ida Dickinson, whose parents, Rev. Lucius Chandler Dickinson and Millicent Ruth (Todd) Dickinson and siblings Mary Dickinson and David Chandler Dickinson signed facing pages in the album. W. A. Evans, signed at St. Johnsbury Center, Vermont, on January 9, 1883; Mrs. Evans signed the right facing page. Mrs. W. A. Evans of St. Johnsbury Center, Vermont. Her husband W. A. Evans signed the left facing page. F. A. Pierce, signed at St. Johnsbury, Vermont, on December 18, 1880. He was Freeman A. Pierce; his wife Olive E. Pierce signed the right facing page. J. Ward, signed at St. Johnsbury Centre, on November 20, 1881. Josiah Ward, whose wife Miranda M. (Ayer) Ward signed the right facing page. Mrs. M. M. Ward, signed at St. Johnsbury Centre, on November 12, 1881. Miranda M. (Ayer) Ward, whose husband Josiah Ward signed the left facing page. Cora M. Whitcher of Walden, Vermont, signed on "10-3-1883"